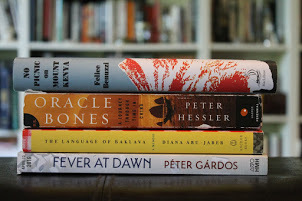 Have you ever traveled in the footsteps of a book? Visited the location where a character lived? Tried to retrace his or her steps? I’ve done this several times, such as on a trip to London when my kids and I visited where Hercule Poirot “lived” in the BBC series we love. House of Windows is a wonderful portrait of place, rendered, quite often, in exquisite lyrical prose. 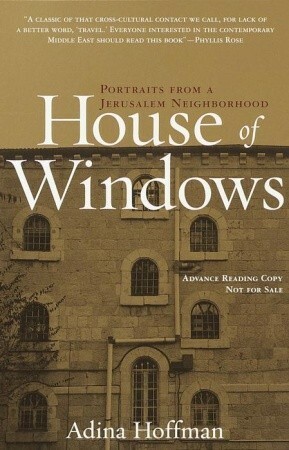 I had given Rivka a copy of House of Windows. I figured she’d get a kick out of it, having fought her own battles trying to feel at home in Musrara. She wrote quite entertainingly about those in her Secret Diary of Jewish Housewife. 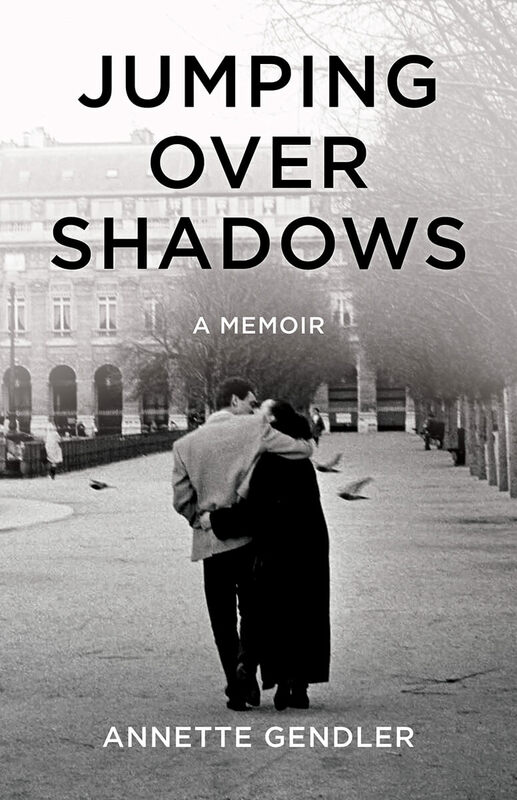 Sure enough, she read House of Windows in one sitting and wrote about her impressions in Through Someone Else’s Window. Rivka brought her copy along on our jaunt. 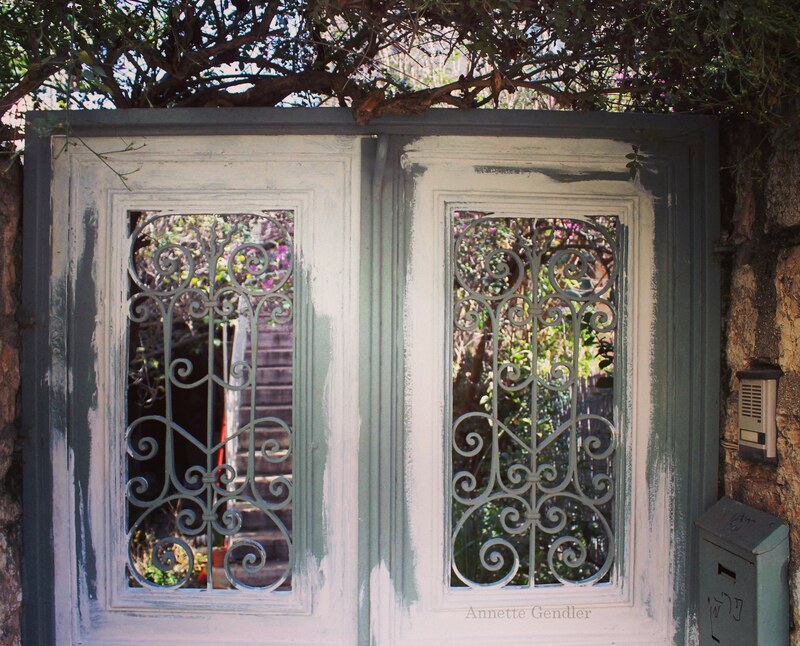 She showed us some of her spots, as well as some she thought were the locations of House of Windows, such as Ahmed’s Garden. One of the old passageways in Musrara that I cannot find on a map. 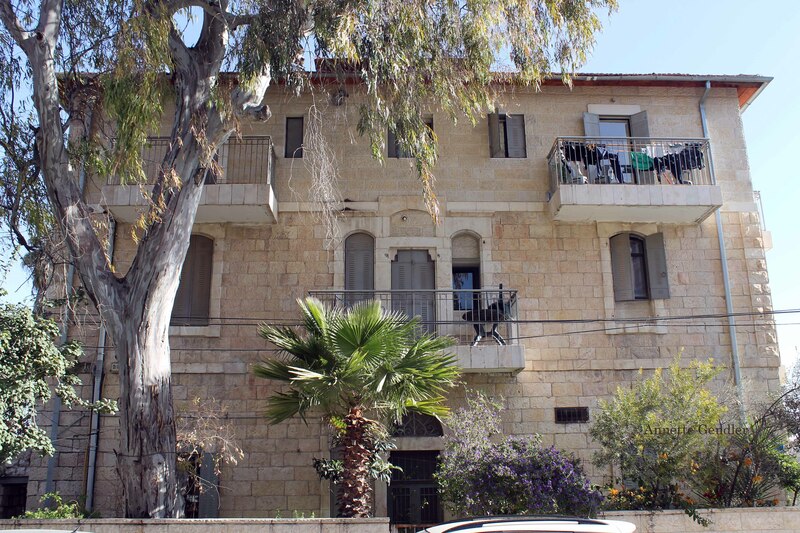 Rivka felt the garden on the right, where the palm leaves lean over the wall, must be “Ahmed’s Garden” from House of Windows. I was also curious about Musrara because it had been a divided neighborhood. From 1949 – 1967 East Jerusalem was under Jordanian rule, and Jerusalem was a divided city just like Berlin had been. As I grew up in a divided country, namely the former West Germany, this strikes a special chord with me. I have jarring memories of the Berlin Wall from my first visit to Berlin in 1982. I have even more surreal memories of visiting East Berlin during that trip. A divided city is a bizarre situation one doesn’t easily forget. 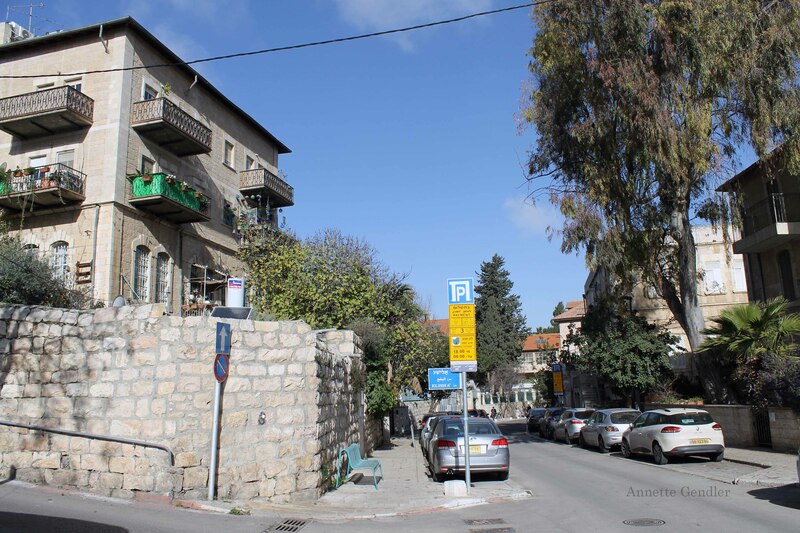 Streets dead-end in a wall, and dangerous no-man’s land abuts regular houses. 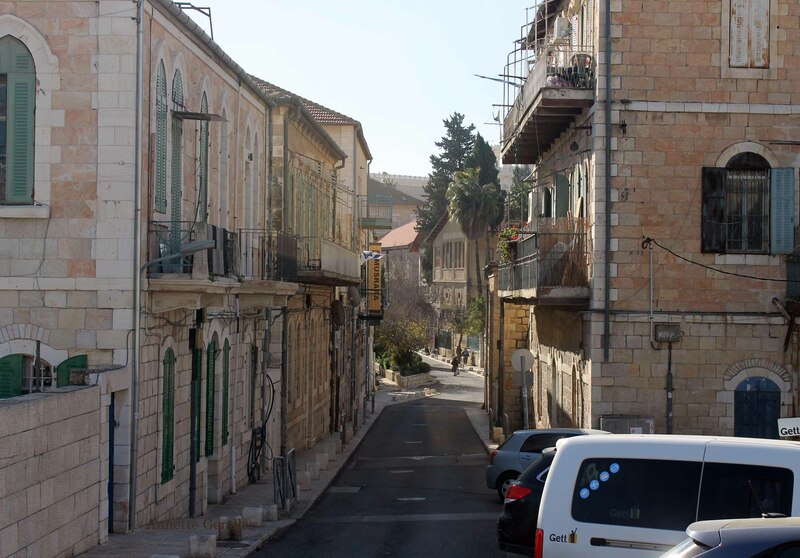 Jaffa Street dead-ended in the concrete border wall. 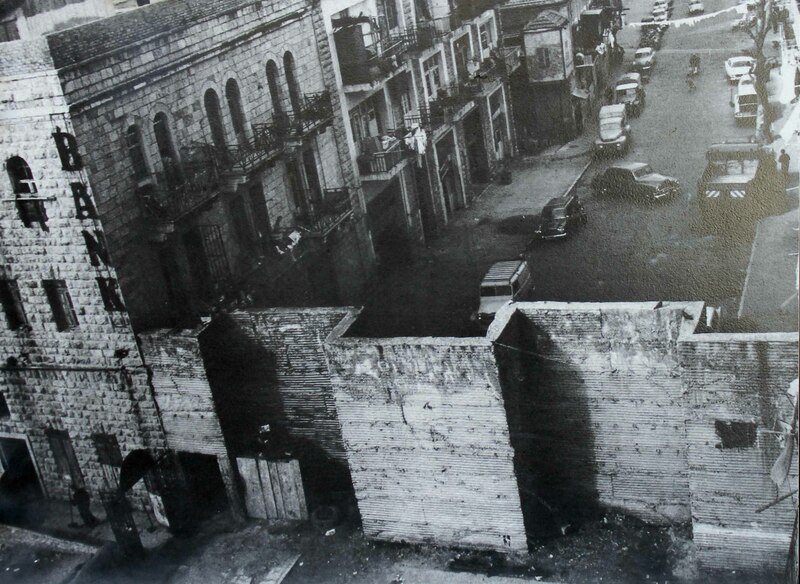 This 1966 photo by Zev Radovan is now displayed on a plaque at this spot on Jaffa Street. 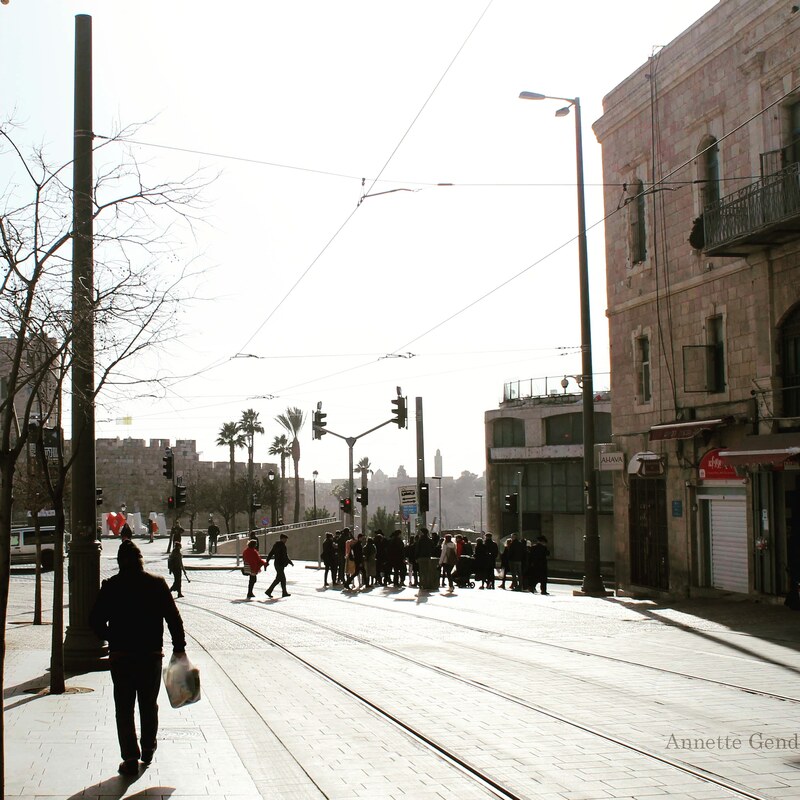 The same spot at Jaffa Street these days, looking the other way toward Tsahal Square. You can see the Old City walls and the Tower of David minaret in the background. 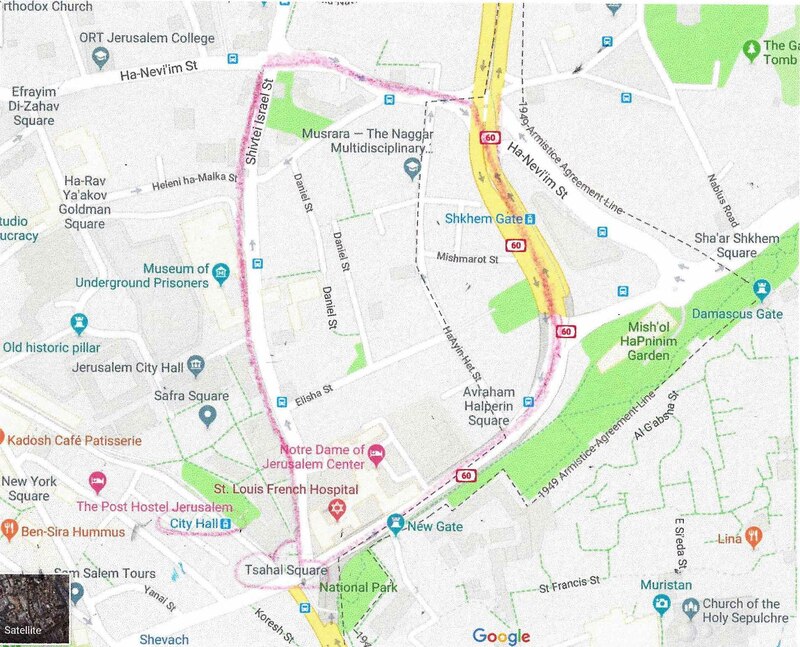 My scribbled-in pink line on this Google map outlines Musrara. In the above map, the dotted line of the former border runs vertically through Musrara along HaAyin Street. To its right (east) was no-man’s land up to the armistice line of 1949. These days, there’s nothing to be felt of this former no-man’s land, at least not in this area. HaAyin Street is just a regular street and bears the signs of a growing city. 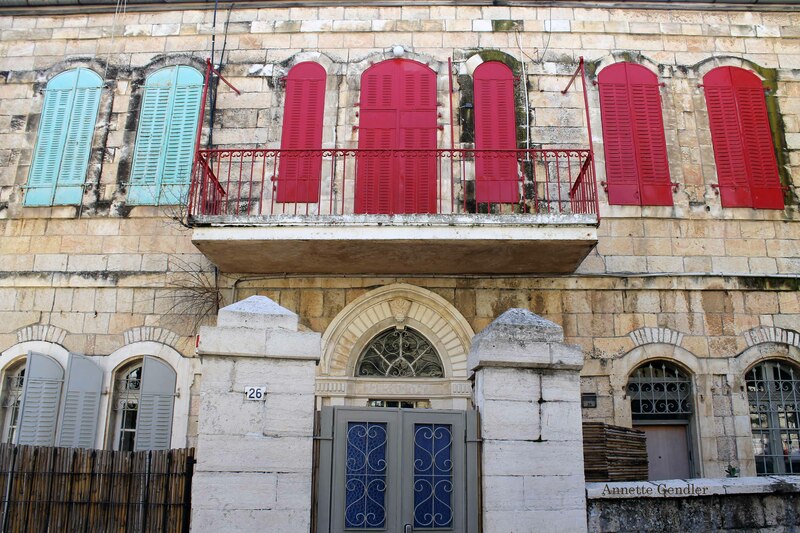 Musrara, centrally located next to the Old City of Jerusalem, has become prime real estate. 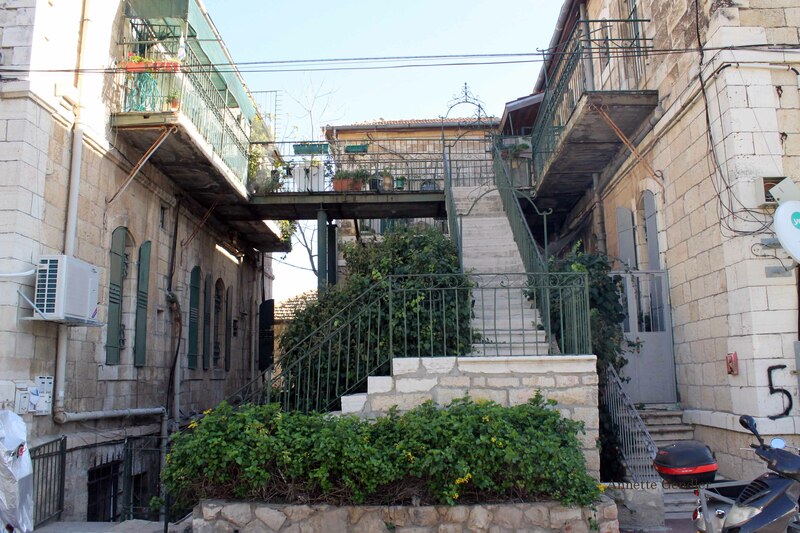 Rivka explained that most old homes in Jerusalem used to be one story, maximum two. These days, many property owners simply add another floor to their building, thus preserving the old while making more space. You can see this in the above picture. Once Rivka pointed this out, I noticed this all over the city! On the other hand, many properties are stuck in limbo. Property rights are unclear or disputed, sometimes an after-effect of the city’s erstwhile division. Some additions have been made without municipal approval. 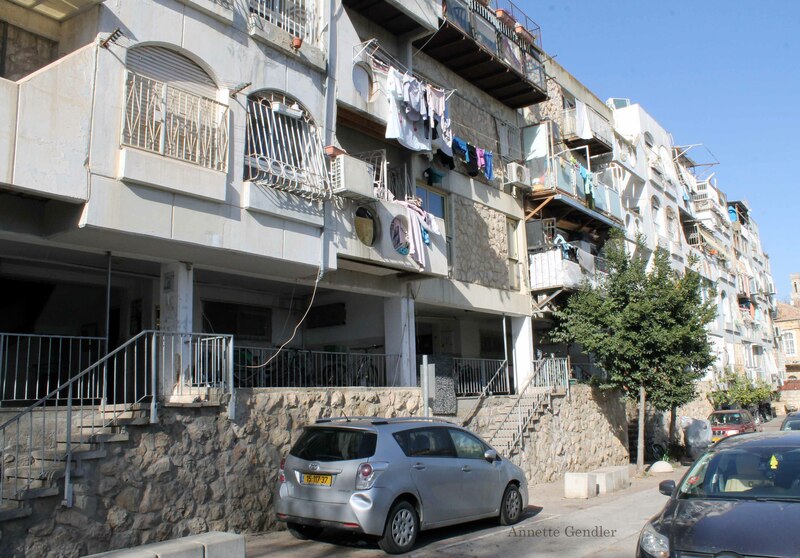 All of this can turn a property purchase into a nightmare, something my friend Rivka sadly experienced when she and her family tried to buy property in Musrara. Musrara is not all picturesque old buildings. 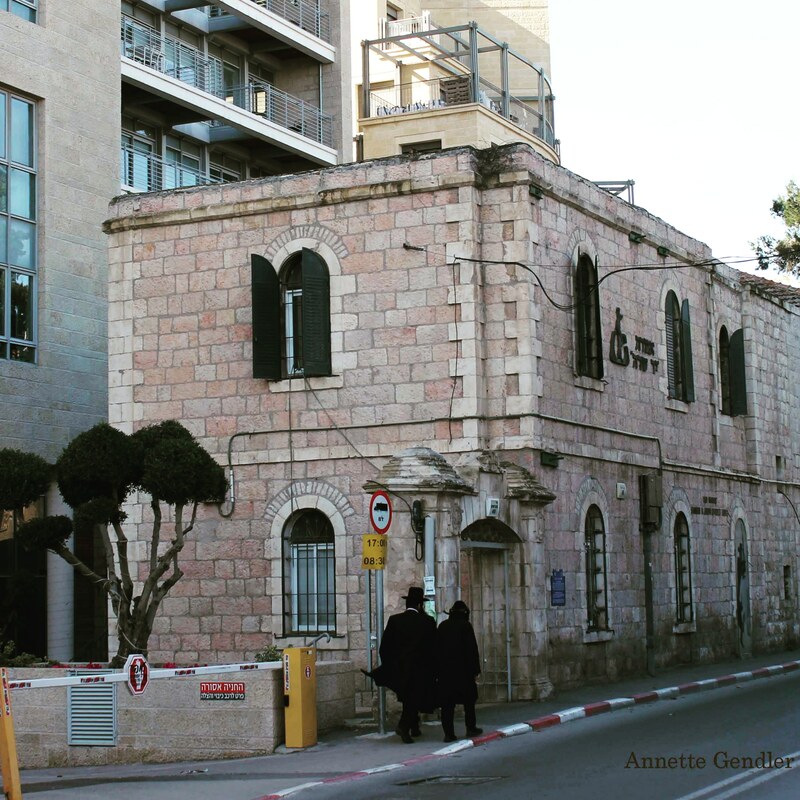 In its midst, it harbors this nasty sin of a building, erected to provide sorely needed housing back when Israel had to accommodate hundreds of thousands of Jewish refugees from Arab countries. But chances are, in a hot real estate market, an ugly apartment building like this one with fairly affordable housing is not going to last. 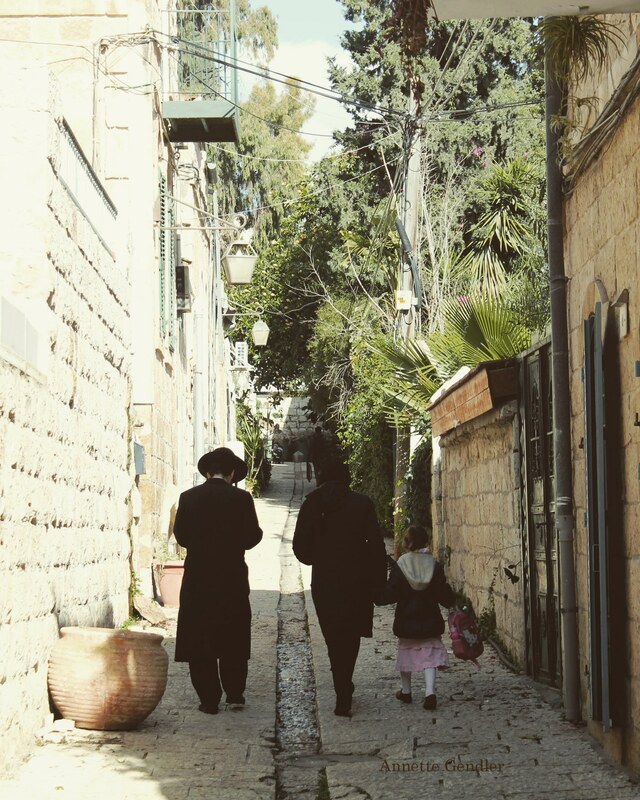 A walk that began retracing the footsteps of a book became another quintessential Jerusalem experience. 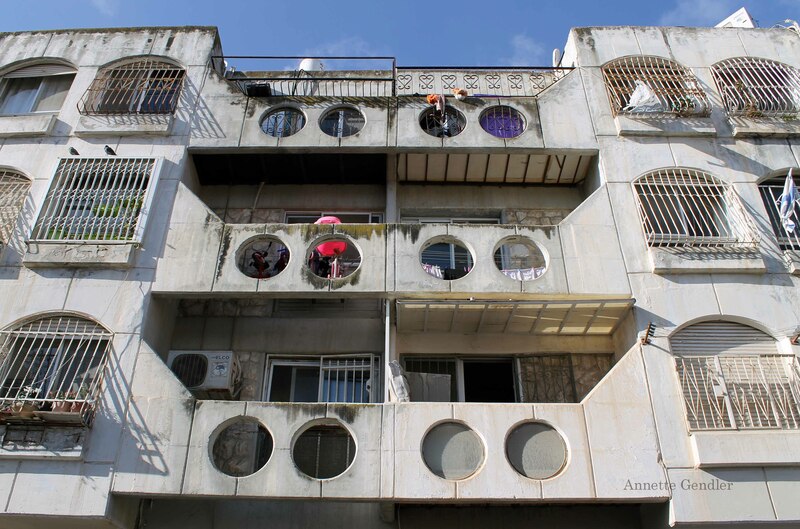 In a small neighborhood like Musrara, one finds so much history, so much complexity, and yet also just everyday city life. Residents wait at a bus stop, go to work, run errands, look for parking. I, the visitor, of course take pictures. 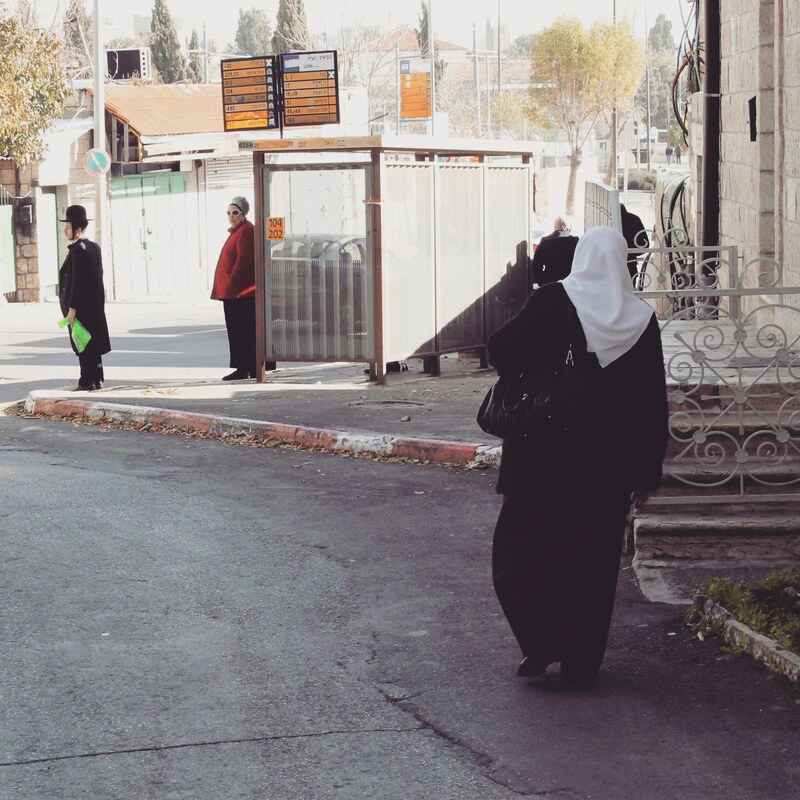 The above images I took in Musrara capture some of what I love about Jerusalem: its diversity of people, its contrasts, and always the old abutting the new. Fascinating! Quite a story, and photos to match. Thanks for taking us around!